You’ll Never Forget the Palmares Festival! In the city of Palmares, Alajuela, Costa Ricans keep the New Year’s Celebration going through January with the world famous Fiestas de Palmares. With mega bars, concerts, bullfights, carnivals and more, everyone will have a good time. It is important to attribute the success of these celebrations to the 30-year history of the Palmares Festival. The Palmares Festival is the biggest festival of the year with a million attendees. So if you are in Costa Rica in January, it is important to set some time aside to make a stop at what some might consider the best festival in the country. What will I experience at the Palmares Festival? Artists from all over the world come to perform their biggest hits at the Palmares Festival. With performances for all music tastes, Palmares is guaranteed to be one of the best music experiences in the nation. The city has been fortunate enough to have performances from groups like Maroon 5, Afrojack, Auténticos Decadentes, local bands, among others. It’s not a Costa Rican festivity without bullfights! However, these bullfights are “a la tica,” meaning that Costa Ricans have a spin on the traditional bullfight. Improvised bullfighters jump inside of the arena to tempt the bull to charge at them while they attempt to dodge it. Costa Ricans enjoy the comedic aspect and how brave people are to jump inside of a enclosed area with a bull. All bulls are also protected by the SENASA, an entity in charge of protecting animals in Costa Rica, meaning they are protected from being hurt by anyone. One of the biggest traditions of the Palmares Festival is the carnival. On the last Friday of the festival, it marks the end of what is known as the biggest celebration in Palmares. People from all over the nation take off work to visit Palmares to celebrate to the rhythm of the local Costa Rican music and the performances of the different troupes (better know as “comparsas” in Costa Rica). 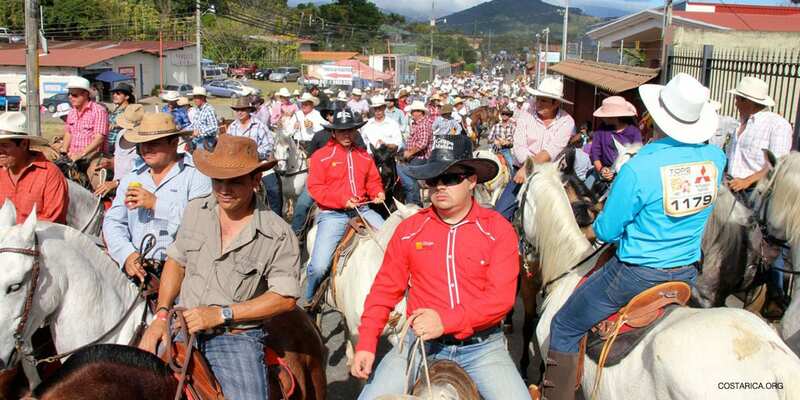 “El Tope” refers to the day in which people bring their best horses to Palmares to walk down the streets and show off their quality. Every year it happens on the first Thursday of the Palmares Festival. Thousands of people ride their horses and come together to celebrate the beautiful activity of raising and taking care of them. SENASA is also present at this event to make sure the horses are provided with water and taken care of. Like every festival in the world, Palmares brings people together to enjoy traditional Costa Rican food and drinks. Many say people drink more beer at the Palmares Festival than any other time of the year. Costa Ricans celebrate all the festivities with the company of nice cold beer, or as Costa Ricans say “birra.” If you want some traditional food with your beer, stop by one of the dozens of food stands available. If you are bringing your family, check out the attractions at the fair. From a haunted house to rollercoasters, the fair will have something to raise your adrenaline levels. These attractions normally work with tickets, so remember to stop by the ticket booth before you head to your next ride. These are a few of the activities Palmares has to offer. With people from all over the country, and even the world, coming together, it is an celebration you will never forget. If you are planning to visit Costa Rica next January, visit Palmares to get a taste of the Costa Rican culture and support this incredible festival.